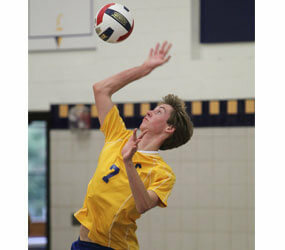 Playing on the Loyola Blakefield volleyball team has become somewhat of a family affair for senior Andrew Stromberg. His older brother Lee Stromberg ’09 was an opposite hitter for the team, and an older cousin also played for the Dons. Stromberg’s coach, Tim Baier, said the teen works hard both on and off the court. When he’s not playing volleyball for Loyola, Stromberg, 17, plays the saxophone in the school’s jazz ensemble and concert band. “Music is enjoyable for me, and with jazz I get to play more interesting pieces,” he said. He is also president of Loyola’s Spanish Club, a member of the National Honor Society and serves on the liturgy committee, which helps to plan school Masses. A Cathedral of Mary Our Queen, Homeland, parishioner, Stromberg has been an altar server since the fourth grade and was recently asked to serve as a sacristan. This past summer, the teen went on a service trip to Bethlehem Farm, a Catholic community in Appalachia, where he learned about green farming and also performed various service projects in the community. When it comes to working hard on the court, Stromberg said he tries to do the best he can wherever he can. Stromberg is not yet sure where he’ll attend college, but said he plans on studying biology or going premed.